A court in Turkey has charged three people with "terrorist propaganda", including a representative of Reporters Without Borders (RSF). It ordered the arrest of RSF representative Erol Onderoglu, journalist Ahmet Nesin and academic Sebnem Korur Fincanci. RSF said it was "an unbelievable low for press freedom in Turkey". The arrests come despite the EU pressuring Ankara to stop prosecuting academics and journalists. The three had reportedly participated in a solidarity campaign in support of Ozgur Gundem, a pro-Kurdish newspaper. Turkish media say they each acted as chief editor for a day. How dangerous is the instability? "This is another dark day for media freedom in Turkey," said Johann Bihr, the head of RSF's eastern Europe and central Asia desk. Mr Onderoglu was arrested for his work on three articles about security operations in Turkey's largely Kurdish south-east and infighting among security forces, said Mr Bihr. 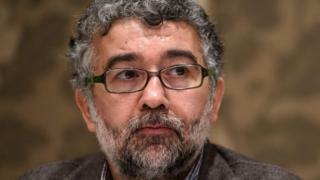 He described Mr Onderoglu, who had worked for RSF for two decades, as a "victim of the abuses he always denounced". The academic Sebnem Korur Financi is the chairwoman of Turkey's Human Rights Foundation, and Ahmet Nesin a well-known journalist. RSF ranks Turkey 151st out of 180 countries in its latest World Press Freedom Index for 2016. Press freedom activists have warned that freedom of expression has dramatically declined recently, and that lawsuits against journalists, academics and other public figures are increasingly common. In May a Turkish court jailed two prominent journalists for revealing state secrets, in a case widely criticised by international observers. Can Dundar and Erdem Gul, editor and Ankara bureau chief of opposition daily Cumhuriyet, reported that Turkey had tried to ship arms to rebels fighting the Syrian government. Turkey is waging a military offensive against the Kurdistan Workers' Party (PKK) in the south-east and is restricting the press coverage of the campaign. Several foreign journalists have been also arrested and deported for reporting the offensive. The EU wants Turkey to change its terrorism laws, and has made it one of the conditions of its controversial migrant deal with Turkey that promises visa-free access to the EU for Turks.